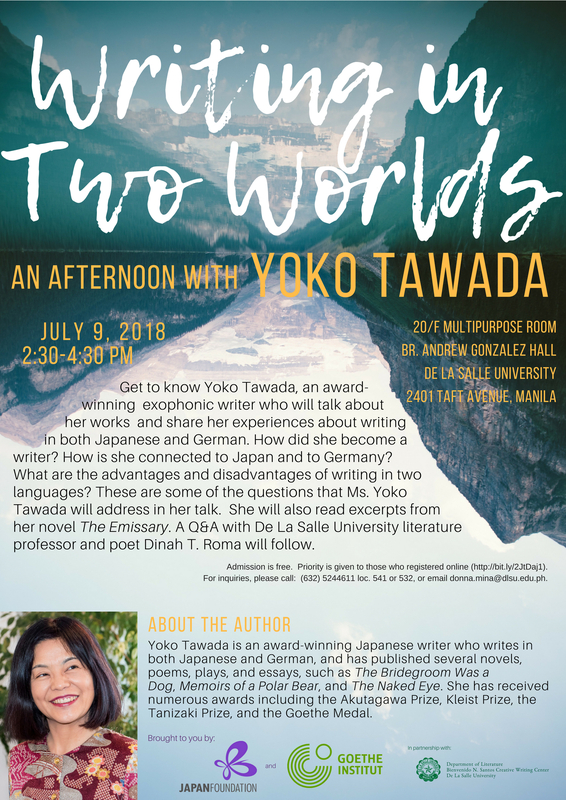 MANILA (June 22, 2018) – The Japan Foundation, Manila and Goethe-Institut Philippinen will host “Writing in Two Worlds: An Afternoon with Yoko Tawada” on July 9, 2018 from 2:30 p.m. to 4:30 p.m. It will take place at the 20th Floor Multipurpose Room, Andrew Gonzalez Hall, De La Salle University, 2401 Taft Avenue, Manila. The literary event was organized in partnership with the Literature Department and the Bienvenido N. Santos Creative Writing Center of De La Salle University. It will feature award-winning bilingual writer Yoko Tawada, who will talk about her works and share her experiences about writing in both Japanese and German. The organizers hope that this literary event will promote cultural and critical exchange among writers from different parts of the globe. Tawada will read excerpts from her novel “The Emissary” and a question-and-answer session moderated by DLSU literature professor and poet Dinah T. Roma will follow. Admission is free but priority is given to those who registered online. As long as seating is available, walk-in guests are welcome. Tawada was born in Tokyo, Japan in 1960 and has been living in Germany since 1982. She obtained her doctorate in German literature from Zurich University and has published several novels, poems, plays and essays. Aside from “The Emissary,” among Tawada’s recognized works are “The Bridegroom was a Dog,” “Memoirs of a Polar Bear” and “The Naked Eye.” She has received numerous awards including the Akutagawa Prize, Kleist Prize, the Tanizaki Prize, and the Goethe Medal. Please note that event dates and details are subject to change. Visit the Japan Foundation, Manila Facebook page (@jfmanila), http://www.jfmo.org.ph or Goethe-Institut Philippinen on http://www.goethe.de/philippinen for updates.